Calligraphy is a traditional Chinese art and a quintessence of Chinese culture. It demonstrates Chinese character's unique artistically glamour by means of composition, structure, and stroke. 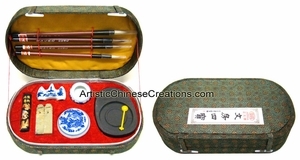 This wonderful boxed set includes four bamboo brushes, a brush rest, an ink stick, a stone palette for mixing ink, a water dish, and a brass spoon. It also includes two seal stones and a red inkpad. 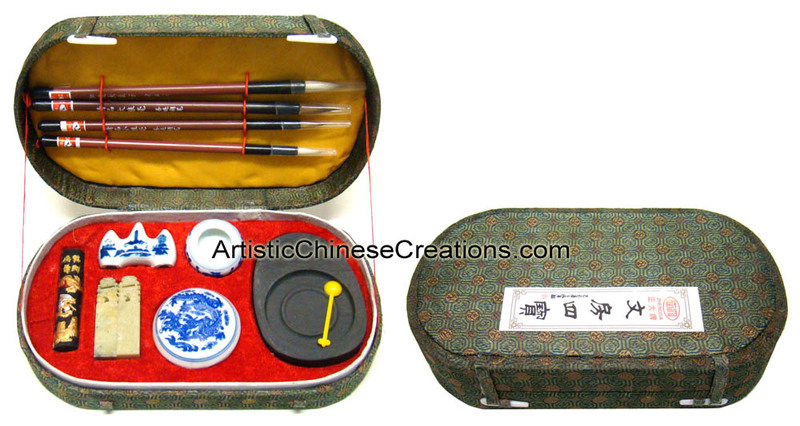 Chinese Calligraphy / Painting Brushes: The brushes should be soaked in water for 10-15 minutes prior to their first use. After each use, the brushes should be cleaned, and the original "point" can be reestablished simply by using your fingers to create a point while still wet. Chinese Ink Stick: The "trick" is to use very little water. Water should be "dripped" upon the stone surface. The ink stick should be rubbed against the moistened stone surface in a circular manner. Depending on the desire for color intensity � the artist will dip the brush upon different areas of the stone. The more water, the less intense the color of the black ink. Ink will collect in the small reservoir of the stone, but it also can be drawn from the overall rock surface. The ink should be kept away from the face. Porcelain Brush Holder: The small curved porcelain piece is intended to hold the brushes in a semi inclined position above the table surface while being used. Red Ink & Chop: Most Chinese Artist "Sign" their work through the use of a personalized carved stone chop. The chop is dipped in the traditional red ink and then applied to either the lower left or right corner of the painting. A chop is enclosed with each set, and ready to be carved.